Contact Piper about speaking to your organization or classroom. Click on a link below to learn more about the organizations that are helping to make our justice system work properly for all of us. This website features a long—but by no means comprehensive—list of organizations that endeavor to change our criminal justice system so that it works properly for all of us. Here are three organizations whose grass-efforts serve to benefit those who need our help the most. Please consider a donation or volunteering your time to one or more of these groups. JustLeadershipUSA is dedicated to cutting the US correctional population in half by 2030. JLUSA empowers people most affected by incarceration to drive policy reform. Those closest to the problem are closest to the solution, but furthest from resources and power. 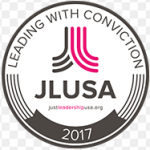 JLUSA provides leadership training to a national network of formerly incarcerated advocates working for criminal justice reform at the local, state and national levels. Campaigns like the push to #CLOSERikers are organized by JLUSA and the network of leaders. Families Against Mandatory Minimums is the national voice for fair and proportionate sentencing laws. They show the human face of sentencing, advocate for state and federal sentencing reform, and mobilize thousands of individuals and families whose lives are adversely affected by unjust sentences. FAMM works to change mandatory sentencing laws through the legislative process on the federal and state levels, participation in precedent-setting legal cases and by educating the public.